Ever since we discovered that our daughter is on the spectrum, we've paid a lot more attention to the news reports of children with special needs wandering off and it terrified me. Our daughter had always been prone to dashing off in the mall or public places, even when we held her hand. She would wiggle free and run off. At one point she even managed to escape her preschool class and nearly out the school doors before a teacher caught her. Luckily we've always been able to catch her, but when she did it to her grandparents, who can't run very fast, we almost lost her completely. I am one of those parents who flat out refuse to "leash" my child in public. You would think that after she reached a certain age, that I would feel more comfortable, but I really don't because she does still tend to wander ever though she's almost 12. I can't hold her hand forever and I seem like a helicopter parent when we are at a store and I am constantly reminding her to stay right beside me. Of course, not only do we have to worry about her mindlessly wandering off, but I just don't trust other people. I've seen the movie based on the Adam Walsh case, and I get anxious just letting her be in the aisle next to me in a store because of it, and that happened during a time when those sort of things were uncommon. Now that human trafficking is a huge problem I'm even more scared to let her out of my sight. At some point I have to let her do things without me hovering, but I still want to ease my mind. AngelSense is a literal lifesaver. 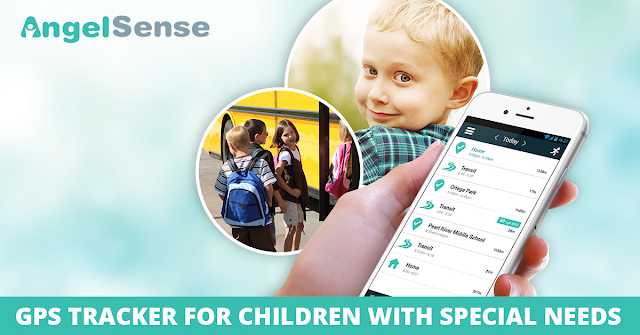 It's a GPS that tracks your child's location in real-time and alerts you if they change course. You can even see how fast their bus is going and more. You also have the ability to talk to your child with 2-way voice which allows you to hear what is going on around them. The device can attach to your child's clothing or a customized special belt. You can find your child in the mall, school, or any indoor facility with a wide cellular coverage. For most parents and children, this may seem a bit excessive and over the top, but for others, it gives us peace of mind that our children are safe, because you never know, especially with the dangers that face our children daily.